WASHINGTON (AP) — Supreme Court Justice Sonia Sotomayor spoke Friday about a book she’s working on about kids with “life challenges,” such as attention deficit disorder, autism, blindness and diabetes. Sotomayor, who was diagnosed with diabetes as a child, she said she wanted to write a book about “all of the common challenges, some visible and not so visible, that kids grow up in the world experiencing.” Sotomayor talked about the book, which is expected to be released in 2019, during an appearance in Washington. The book is one of three by Sotomayor announced in November. The first two books, due out in the fall, include a version of Sotomayor’s best-selling 2013 memoir, “My Beloved World,” adapted for middle-graders. The other book, “Turning Pages,” is a picture-book autobiography about the books that inspired her. 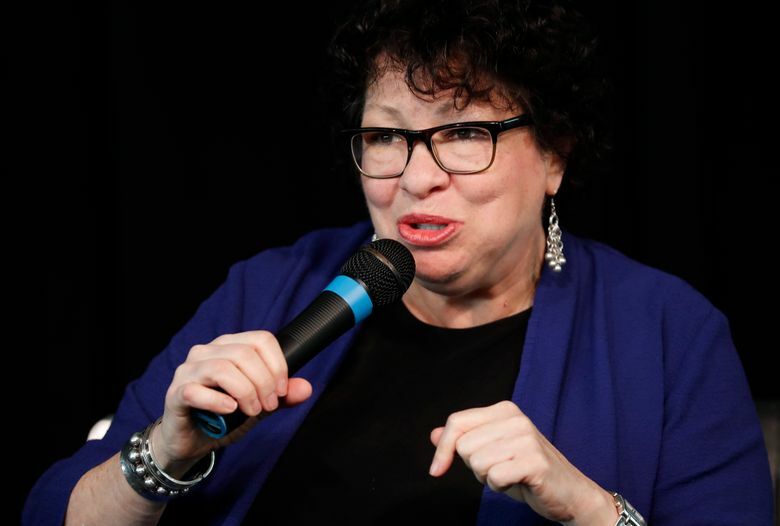 Sotomayor spoke at the liberal American Constitution Society’s national convention and answered questions from Berkeley Law professor Melissa Murray, a former clerk. The justice was wearing a sling following shoulder replacement surgery about a month ago. She told Murray she injured herself when she tripped over a piece of furniture. Sotomayor said her surgery also meant she couldn’t take a planned May trip to Puerto Rico, a trip that would have been her first to the island since it was devastated by Hurricane Maria in September. Sotomayor has family on the island and said most of her relatives, over time, got water and electricity back — but only last month did the last of her relatives get both. “The challenges are great,” she said, mentioning rolling blackouts and limited supplies.